For use on all wood types, BEHR Waterproofing Wood Finish is ideal for decks, fences, siding and outdoor furniture, where a clear or wood-toned finish is desired. Available in Natural, Ced Natural tone & Redwood finishes. 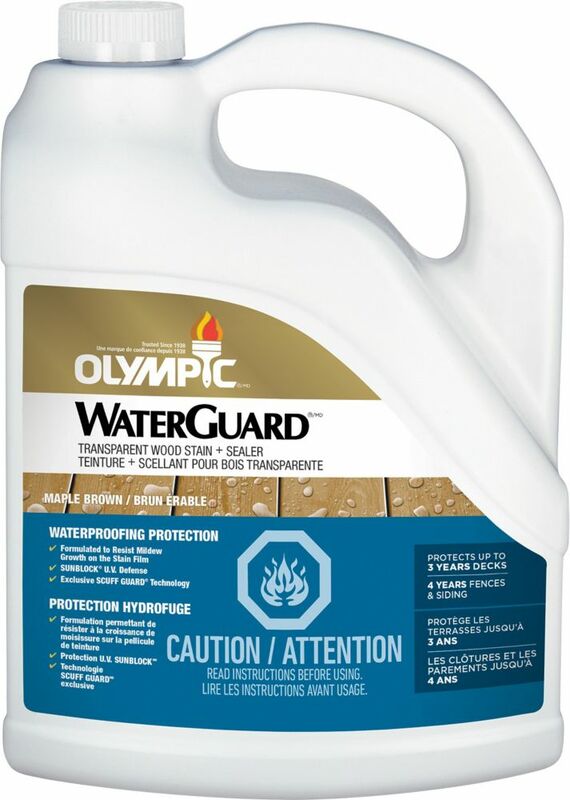 Oly WG Trsp S+S M Brown 3.78L-55166C OLYMPIC WATERGUARD Transparent Wood Stain + Sealer has been specially designed to provide complete outdoor protection for your wood. A subtle hint of colour maintains the natural beauty of wood. Ideal for deck, fences, outdoor furniture, railings and siding. Available in 4 ready-mix colours. One coat is sufficient for maximum protection.